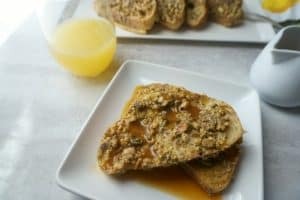 This french toast recipe captures all the loved flavors of baklava--butter, honey, cinnamon, walnuts, and pistachios, with easier preparation and quite a few less calories. Prepare bread dipping station by whisking eggs, vanilla, cream, 1 teaspoon of cinnamon, orange zest, and dash of salt in one shallow dish and the nuts in separate shallow dish. Heat skillet over medium heat and melt one tablespoon butter in skillet. Dip the slices of bread into egg mixture,allowing to soak up a bit on both sides. Then place one side of bread into nut mixture, pressing down to crust the bread with the nuts. Place nut-side up in the skillet and repeat with half of the bread slices. Cook the bread for about 5-6 minutes in the skillet, or until bottom is nicely browned. Transfer to baking sheet. Repeat steps with remaining butter and slices of bread. Bake all the slices for 20 minutes, or until nut-side of "Greek" Toast is browned and egg custard is set. While preparing the toast, Make the syrup by simmering the honey, remaining teaspoon of cinnamon, juice of the orange and water over low heat. Let simmer until Greek Toast is ready to serve. Serve the crusted "Greek Toast" with a bit of the Cinnamon Honey Syrup.